A great way to introduce young ones to color recognition and matching skills! 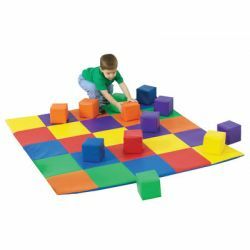 Multipurpose mat easily wipes clean and is great for shielding children from non-hygienic surfaces, or a gentle soft place for just PLAY! Vinyl covered nylon mat with 1" thick virgin foam. Meets California TB117 fire retardancy standards. Mat is 57"L x 57"W. Additional shipping charges apply. 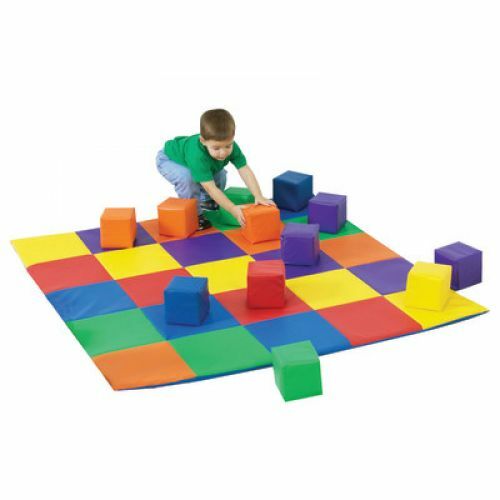 Includes set of 12 Toddler Blocks.